Océ VarioPrint 6320 | Welcome to JJ Bender! Océ Gemini technology uses a single engine to drive two imaging belts at once. 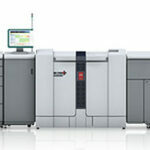 Two-sided jobs print faster and more reliably because each sheet only passes through the engine once. Meanwhile, Océ ScreenPoint technology delivers dazzling image resolution of 600 x 1200 dpi for halftones and photographs, with the near-perfect sheet positioning and100-percent accurate registration that duplex jobs like books require. The Océ VarioPrint 6320 Ultra+ and TP+ Lines have been developed from their market-leading predecessors in order to maintain their status as the most productive digital perfecting systems in their class. Improved media handling and an intuitive new graphical user interface ensure print professionals benefit from high quality results – whatever the application. And with impressive environmental credentials your carbon footprint is kept to a minimum too. 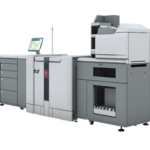 The Océ VarioPrint 6320 Ultra+ is part of the Océ VarioPrint 6000 Ultra+ and TP+ Lines and is the fastest duplex printer in the series, capable of a stunning 314 A4 images per minute. These performance credentials make it the perfect solution for even the most demanding double-sided printing jobs.At the heart of every device is Océ’s unique Gemini technology which uses a single engine to drive two imaging belts, enabling both sides of a page to be created in just one pass – making it not just ultra-quick but ultra-reliable too.